Compliment medical weight loss and lipotropic injections in Los Angeles with healthy, vibrant flavors of exotic fruits. Fresh fruits don’t come in a can, but you wouldn’t know it by the way many of us purchase and eat fruit. Even a lot of the ‘fresh’ produce available at the local grocery store has undergone extreme processing with pesticides and preservatives, and the natural taste of the fruit is often all but gone by the point it reaches our plates. This is enough to make anyone grow tired of the same old fruits, but by introducing exotic fruits into your diet you may find that you enjoy the fun flavors fruits offer after all. An apple a day may keep the doctor away, but eating the same fruits each day can drive a dieter mad. The vast majority of people in the United States do not consume the daily recommended amount of fruit, and some believe this is due to boredom with fruit options. There are thousands of fruit varieties to choose from, but many people only consume four: apples, watermelon, bananas and oranges. The boredom of eating the same fruits over and over again can lead people to avoid fruits altogether. 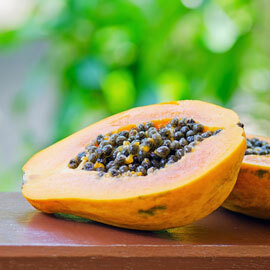 To avoid this ‘fruit fatigue,’ try indulging in the following nutrient-rich, delicious and more exotic fruits. Quince is an exotic alternative to apple that will delight your taste buds with its tart flavor. The fruits are quite dense but can be softened by mixing poached slices with water, honey, sugar, vanilla bean and lemon juice. Papayas are packed with more fiber than apples, and eating just one can provide nearly 20 percent of the daily recommended amount of fiber. Try eating papayas plain, or mix with cucumber, salt, lime juice, chili powder and sliced jicama for a refreshing and exotic salad. Like bananas, kiwis are a great source of potassium and are very nutrient-dense. Plantains look similar to bananas but have an even sweeter taste. Try baking or sautéing them for a healthy and delicious snack. Both watermelon and guava are rich in lycopene, which can lower the risk of developing heart disease and cancer. Asian pears have a similar consistency to the melon and are moist, crisp and mildly sweet. Star fruit is an excellent source of vitamin C and is also high in choline, which promotes healthy cells. Kumquats taste similar to oranges but have an extra tangy bite. Have you tried spicing up your weight loss diet with these exotic fruits? Share your thoughts and experiences in a comment below!